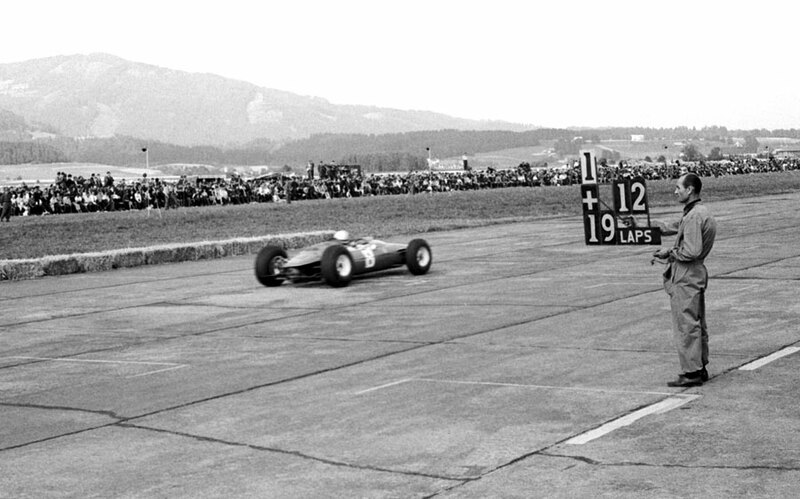 Austria hosted its first grand prix on a makeshift circuit at the Zeltweg airfield, the only time this location was used. Lorenzo Bandini, the second Ferrari driver, scored his first and only championship victory, as the bumpy track accounted for the retirement of nine of the 20 starters. The Zeltweg circuit was bordered by straw bales and the uneven surface played havoc with the cars, with gaps between the concrete slabs punishing suspension and steering systems. After a chaotic practice session in which various drivers suffered suspension failures, Graham Hill took pole with Jim Clark and John Surtees alongside him. At the start, Dan Gurney roared into the lead, closely followed by Surtees, who went ahead on the second lap. He stayed in front for the next half an hour until his rear suspension broke seven laps later, leaving Gurney with a comfortable lead over Clark. Hill had already retired with a broken distributor drive. Clark began to close the gap, but before he could really assert himself, he too was out of the race with a shattered drive shaft, leaving Gurney with a huge lead over Bandini. Gurney was the next to go, also with suspension failure, which left Bandini out on his own in front, 17 seconds ahead of Richie Ginther in the BRM. There he stayed, finishing six seconds ahead of Ginther, and marking the second successive victory for Ferrari. Former champion Phil Hill had a lucky escape when his Cooper Climax flew off the track at a corner and careered into straw bales. As the car exploded into flames Hill jumped out and walked away unhurt. Half way through the race the paddock was strewn with broken cars, and the general opinion of drivers and team managers was that the temporary surface of the air force base was not up to world championship standards. "This course proved a car killer today", said Jack Brabham. "It is far too rough for a modern grand prix race. We haven't designed cars to race on circuits as rough as this." Not surprisingly Austria wasn't awarded another grand prix until they built a permanent circuit just down the road. Bandini's win did not affect the top of the world championship standings, with Hill still two points ahead of Clark, but it did move him up into fifth.